The most ferocious offering of Pontiac Firebird range has cemented itself in pop culture as an icon of masculinity. It was too powerful to compete in the race series it was named after. The car, sporting a burning, screaming bird hood ornament, has been driven by generations of macho men on and off the big screen. 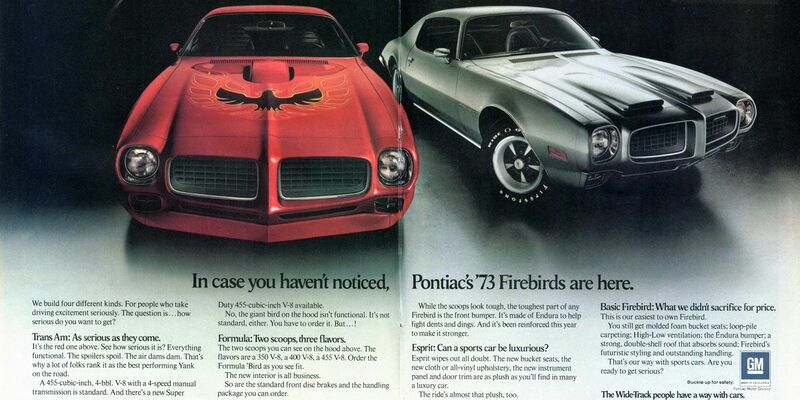 Trans Am name was used to brand the fastest version of Pontiac Firebirds. The name first appeared in 1969, when General Motors upgraded their Firebird to compete in SCCA (Sports Car Club of America) Trans American cup. Unfortunately, the car’s engine displacement was too big to compete in any class of Trans Am, all of the Trans Am’s V8s were over SCCA’s 5.0-liter limit. While the car never competed, the name remained – GM settled on a deal to pay $5 for each Trans Am sold to SCCA. Sales of the first generation Trans Am did not really take off. With just around 700 cars sold, the name only became widely recognized when the second generation cars were launched in 1970. Not only had the car come with an updated 7.5-liter V8 (while the old 6.6 and 4.9-liter motors were offered), but it was also the first car to have the iconic bird hood ornament. Second generation Trans Am produced up to 370 bhp and had an upgraded suspension, brakes and exterior compared to the standard Firebird. Pontiac designer Bill Porter first got an idea of transforming the signature firebird to cover a majority of the hood, encompassing the odd-looking scoop in 1970. But when he eventually proposed it, the GM’s VP of design, Bill Mitchell dismissed it, he thought it looked like the car “has an Indian blanket on the hood”. John Schinella, who replaced Porter, was convinced the bird has to be a success. He tweaked the design, put it on a hood of a Firebird and drove to town. After getting positive feedback from the public, he improved the design, using Lotus racecar black and gold theme and pitched the idea to his bosses once more. This time round, the design was approved and made it into production. 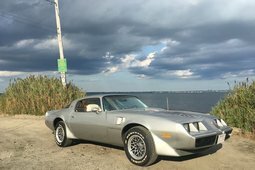 1977 Pontiac Firebird Trans Am "BANDIT"
Second generation Trans Am Turbo, an oddity sold in 1980 and 1981, is worth a separate article on its own. In fear of increasing oil prices and more stringent environmental regulations, GM were experimenting with various smaller displacement turbocharged engines, including V6s and inline-4s. The results were promising, so engineering students in General Motors Institute set out to develop a turbocharged version of Buick 4.9-liter V8 to replace the 6.6-liter motors in Trans Am. While the idea sounded good, and so did the name, just say “Firebird Trans Am Turbo”, the car did not deliver sufficient performance. The boosted V8 could only push out 210 bhp, a far cry from motors it was replacing. 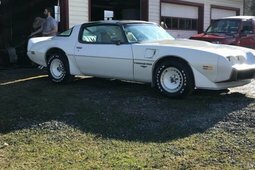 The third generation Trans Am was offered from 1982 till 1992, it utilized a new 5.0-liter V8 as well as completely new Firebird unibody construction, compared to the old body on frame. A new 5.7-liter engine was offered from 1987, making it the most powerful Trans Am on offer, putting out up to 235 bhp. This engine came in Pontiac Trans Am GTA (Gran Turismo Americano), the car so American, it is mentioned in its name twice. Most of the GTAs were sold with an automatic gearbox, thus if you want a manual, you are better off looking for a 5.0 Trans Am. Unlike the previous generations of Firebirds and Trans Ams, the third generation cars did not share the body shape with Chevrolet Camaro. But this time, all of the engines were derived from Chevrolet, rather than developed by Pontiac themselves. 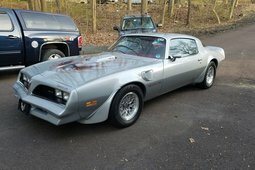 The Trans Am continued to be offered as the top of the line option of fourth generation Firebird, with options of 5.7-liter V8 sourced from either Chevrolet Camaro or Corvette of the era. The output of these engines ranged from 275 to 325 bhp. 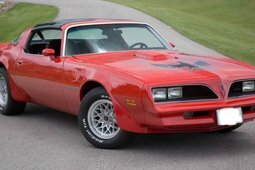 Up until 2002, when the Firebird was discontinued, the Trans Am package offered more horsepower, uprated handling and aesthetic tweaks over the standard Firebird. The cars with a flaming bird on the hood made it to the big screen, contributing to the popularity of the model. 1976 action film about coast to coast race in US, “Cannonball!” starred a red second-gen Trans Am. 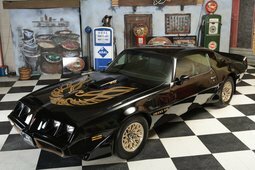 But the Trans Am truly left a mark, or perhaps two skid-marks, in Hollywood’s history, when it was piloted by Burt Reynolds, the very epitome of masculinity from the 70s, in Smokey and the Bandit. Reynolds, playing the Bandit, drove a black and gold facelifted Trans Am in two parts of the film series. Although he last appeared on the screens in his cowboy hat and targa-top Trans Am in 1983, he put the second generation Trans Am along other film Icons, such as James Bond’s DB5 or Bullit’s Mustang forever. The following generation of Trans Am most famously appeared in TV series Knight Rider. Unlike in the case of Smokey and the Bandit, the Trans Am lacked a burning bird hood ornament, and the hero driving it lacked moustache. But what was lacking in moustache department, was compensated by state of the art technology – K.I.T.T., the Trans Am in the show, could drive itself and talk to its owner Michael Knight, played by David Hasselhoff. The antagonist car in Knight Rider, K.A.R.R., was also a modified third-gen Trans Am. There is no shortage of Pontiac Trans Ams, but their prices highly depend on the state and generation of the car as well as the engine. They can cost anywhere in between €500 for a smaller engine car from the late 70s in a desperate need for restoration up to €50,000 for an immaculate earlier example with a big engine. 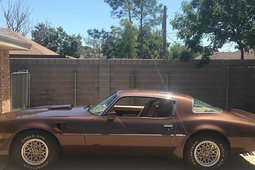 The geography plays a role as well, these cars are plentiful in the USA, and it might take longer to track down your perfect Trans Am in Europe.